The Nova Scotia duck tolling retriever is a fun-loving and affectionate dog. The Toller loves the water and is happiest when out on the hunt. 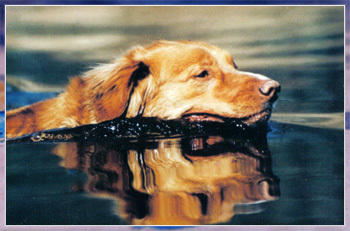 As with other retrievers, this dog is playful and full of energy with a strong retrieving desire. It is a loyal and loving family pet that loves to please. He does well with children, is patient, and loves to play, especially fetch. The breed also gets along well with other pets in the family. When strangers approach, the Toller will usually bark but rarely does anything more. He is a gentle dog that prefers to be with his family than alone. The duck Toller is an intelligent dog and learns obedience quickly if handled properly. Young dogs tend to be easily distracted and need lots of patience. The breed also tends to become bored with repetition so training sessions should be kept challenging and interesting. All in all they make great family pets! Again my youngest daughter was the start of our Nova Scotia Duck Tolling Retrievers! My good friend’s mother had a litter of puppies that included Emma. Emma was sold and returned, labelled untrainable! My friend asked me to take Emma and train her before being sold to a hunting home. I agreed, just for a short while, as Tollers SHED! My daughter of course fell in love with the wild red dog and Emma became our foundation female. Emma forced me to expand as a dog trainer, to put it mildly. Two weeks before Emma died she was 6th in her height category at the Agility Association of Canada’s Canadian Nationals. She is always missed. Tollers were meant to frolic along the beach and attract the ducks, and they are very good at their job! Arrow has been known to get silly during an obedience run through, throw himself down and roll happily on his back while the crowd roars. But ask them to retrieve and they will go all day.